Mixed marriages in Ireland A Century ago. A report on "Catholic-Protestant Relationships in Northern Ireland" by Katrina Lloyd and Gillian Robinson published by the Economic and Social Research Council in April 2008 as Research Update No.54. A report "Mixed Marriages in Northern Ireland" by Valerie Morgan, Marie Smyth, Gillian Robinson and Grace Fraser. Published in 1996 by the University of Ulster, Coleraine. Available from the CAIN (Conflict Archive on the INternet) website. A report on "Cross-Community Marriage in Northern Ireland" by Gillian Robinson published by Centre for Social Research in 1992 as appears on the CAIN (Conflict Archive on the INternet) website. NIMMA has been involved in research nto mixed marriage. 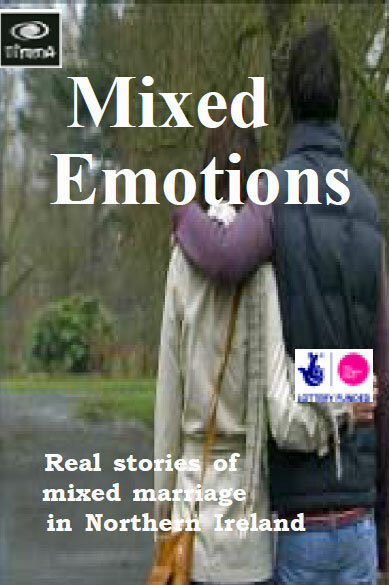 Our recent publication "Mixed Emotions" created considerable stir and won significant praise. We have plans for further research looking into the lives of children of mixed marriage and also the experiences of those who felt compelled to leave the country due to being in a mixed marriage. Address: 28 Bedford Street, Belfast., Norhern Ireland, BT2 7FE. © 2015 Northern Ireland Mixed Marriage Association.